I agree with Tom, this Putin guy is pretty stupid. 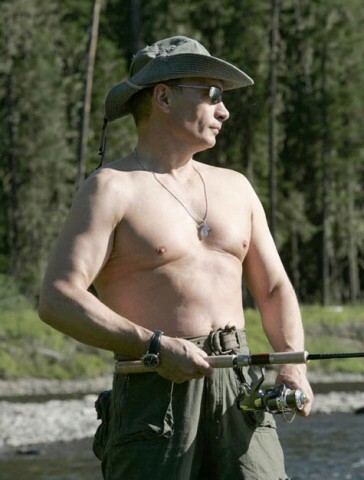 Putin’s a real piece of work — typical of the macho-man goon you get from the Gap. Idi Amin wrecked Uganda, Poppa Doc made sure that absolutely nothing positive happened in Haiti. Putin’s right out of this mold. MOSCOW, Nov 12 (Reuters) – Russia may scrap its Baltic Sea gas pipeline project, Nord Stream, and build gas liquefaction plants instead if Europe keeps delaying the pipeline, Russian Prime Minister Vladimir Putin said on Wednesday. The European Union has identified the plan to pump Russian gas under the Baltic Sea by to Germany — involving Russia’s Gazprom (GAZP.MM: Quote, Profile, Research, Stock Buzz), Germany’s E.ON EONG.DE and BASF (BASF.DE: Quote, Profile, Research, Stock Buzz) and Dutch Gasunie — as a key project to ensure secure gas supplies for Europe. But what do you think his real motive is? Haha. Bloomberg calls Putin’s latest move, a partial currency devaluation is clumsy. I agree. We should be doing what we can to encourage a default by Russia, including looking at ways of limited Russia’s earnings of hard currency, potential nationalization of Russian industries (that is Gazprom assets) abroad, and so on. Whether you say that Putin’s Russia is a comatose regime on life support or merely on an IV drip, it’s pretty clear that we have a Gap state operating on braindead form of autopilot which is aggressive to the extent it can afford to be, determined by oil and natural gas prices. Dude…my boss walked by while I was opening the post. The Putin-as-Cheesecake photo may cause me some trouble. Then absolutely do not google for information of the new biopic of Sarah Palin, starring Lisa Ann, while at work! Not sure how I feel about this part–the steel mill in my home town is owned by a Russian company. While I don’t know if Evraz is under Putin’s thumb, I’m pretty sure nationalizing the mill would be bad for it and Pueblo. ” According to Mr Levitte, the Russian seemed unconcerned by international reaction. “I am going to hang Saakashvili by the balls,” Mr Putin declared. Maybe Sarkozy should be the one leading the horses to water. Not sure how I feel about this partâ€“the steel mill in my home town is owned by a Russian company. While I donâ€™t know if Evraz is under Putinâ€™s thumb, Iâ€™m pretty sure nationalizing the mill would be bad for it and Pueblo. The concern is less the power that Putin might have in this-or-that project, and more in stressing his hard currency situation. A more realistic approach is probably excessive tax, legal, and environmental impact scrutina (a la lawfare ). Sarkozy’s an interesting duck… Perhaps best used as proof that Europe can generate forceful and self-interested leaders, but that the current legal structure of the European Union prevents this from happening on a Union-wide level.